Nubia finally unveiled its new smartphones today at an event in China, and the company was teasing these phones for past couple of months. So, Nubia Z17S and Nubia Z17miniS have been launched today where the Z17S is the high-end flagship whereas the N17miniS is the mid-range phone. In this article, we are going to talk about the best and the most interesting Nubia smartphone so far, the Nubia Z17S. One of the key highlights of this device is its display. As mentioned in the title, the phone rocks a 90.36% screen-to-body ratio that means this could be the very first smartphone to feature screen-body-ratio more than 90%. FYI, the screen-to-body ratio of the Galaxy S8, Mi Mix 2 and the iPhone X is respectively 83.6%, 80.2%, and 82.9%. The phone is very much similar to the Z17 from the back with that same dual rear camera arrangement, but this time, the phone features glass on the back and not metal. From the front, the phone looks incredible due to that display with no side bezels and very narrow top and bottom bezels. In fact, unlike the previous Nubia phones, there is now no capacitive home button to give more room to the display. The USB Type-C Port is on the bottom along with the Speaker Grill and the primary microphone. Sadly, the 3.5mm headphone jack is not there on the phone so, there is only one port, i.e., the USB Type-C.
Now coming to the specifications of the phone, the Z17S features an LTPS TFT 5.73-inch Full-HD+ Display with 2160x1080p resolution and 403ppi pixel density. The Corning Gorilla Glass protects the display. The phone is powered by2.45GHz octa-core Snapdragon 835 processor along with Adreno 540 GPU. There is 6/8GB LPDDR4X RAM and 64/128GB UFS 2.1 internal storage. Sadly, there is no microSD card support on the phone. Coming to the cameras, there are four cameras on the phone, i.e., dual cameras on both the rear and the front. On the rear, the phone features a 12MP primary camera (Sony IMX362 sensor) with f/1.8 aperture while a 23MP Secondary camera (Sony IMX318 sensor) with f/2.0 aperture. The camera offers the depth of field effect aka Portrait mode. On the front, there is a combination of dual 5MP cameras with f/2.2 aperture and portrait mode. The smartphone runs on Nubia UI 5.1 which is based on Android 7.1 Nougat. There is also the NeoVision 7.0 technology. Under the hood, there is a 3,100mAh battery that supports the 26W flash charge. 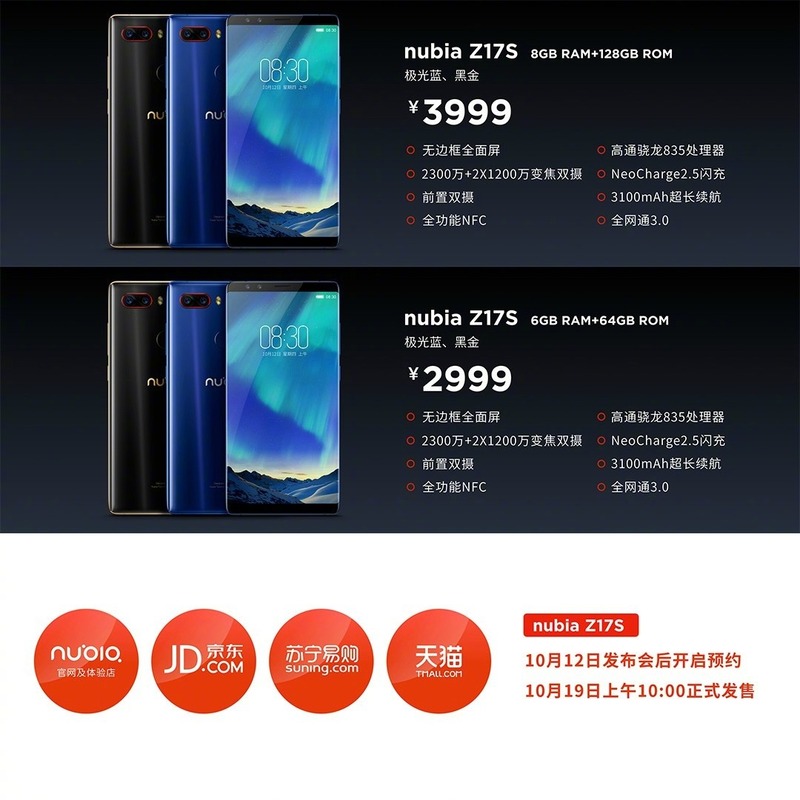 The sale starts on October 19th, and the device will be available from official Nubia Store, JD.com, TMall.com and Suning.com. What are your views on the Nubia Z17S? Do you want the phone to be available globally? Do let us know your opinions in the comments section.